MedPro Connect's professional Risk Assessment Counselors will help you determine which tests are right for you based upon your general concerns, symptoms, recent sexual activity and potential exposure to an infected sexual partner. The only way to know if you have an STD is to get tested. When you are concerned about potential exposure to an STD, getting tested for a single STD is very risky as there is no way to know which STD you may have been infected with. We always recommend that our clients "remove all doubt" by taking advantage of our Comprehensive STD Panel which tests for the eight most common STDs. When this is not a viable option for you, our Early Detection STD Panel provides testing for the four most commonly requested STD tests. 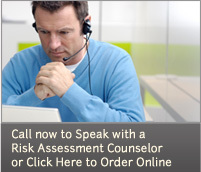 Call today to speak to your personal Risk Assessment Counselor to determine which STD Test Panel is right for you.